Perhaps also it is in the inherent difficulty of being able to easily predict exponential rates of change as easily as we do simple arithmetic rates of change. Remember that problem about the nasty creature in the bucket? 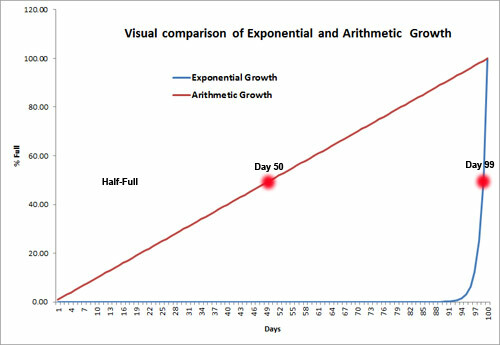 The scary part of exponential growth is that for most of the time you can’t even see much going on. let alone easily predict that it will mushroom into a major problem. For almost the whole 100 days, the nasty creature will just be a smear on the bottom of the bucket. Well, human population growth is also an exponential problem, so while we may not see the problem as dangerous yet (just a smear on the bottom of the bucket), and we at our present state of knowledge cannot accurately predict when the population of the world is so much too much that it will collapse (a bit like when the bucket is full), we do know that if it is left until the problem is really obvious (bucket half full), it will likely be too late. The human population is not quite as simple as the story about the nasty beast in the bucket. For example people don’t split in half to reproduce, they have babies. Some women have none in their lifetime, some a few, some quite a few babies. The total fertility rate (TFR) is the average number of babies women have in their lifetimes. Theoretically, when the TFR = 2, the babies replace both the father and mother in the population. In fact, of course, some babies die before they grow up to have children so the TFR needs to be just a bit more than 2.0 to replace everyone who dies (a TFR of 2.1 to 2.3 depending on the death rates of the children in any given country). The actual TFR needed to maintain a constant population in any given country or area, is call the replacement rate. At the present time the TFR of the world is more than enough to keep the population growing for sometime to come, even though the replacement rate in some countries is at 2.0 or below. If it remains constant at its current value of 2.06, the human population will reach 9.5 billion by 2040, and peak at about 11.5 billion. Considering the difficulty of feeding even the 7 billion people we have today it is hard to imagine a world with over 11 billion people. Suppose the people get frightened and decide to have more babies to ensure that their children have the best chance of at least some surviving. If the TFR rises by only 5% (2.17), the population will exceed 20 billion. Of course long before that happened, total chaos and disaster would overtake the human condition and massive die-offs would happen due to wars, disease, starvation, and territorial disputes. We surely do not want that. But remember in an situation of exponential growth it is not easy to see the problem until it is really too late. However, a 5% drop in TFR to about 1.96 would eventually result in a world population of about 6.1 billion. That is a much more reasonable figure, although even that is too high according to many experts in ecology and agriculture. Given all the factors, the current most accepted prediction is that the population will peak at about 9.5 billion people. That requires a continuing reduction in the TFR which may or may not occur. We certainly don`t have a lot of time to figure it out and make the adjustments. Here is what the recent history of the world`s human population has been doing. As you can see, after the entire history of human kind (over ten thousand years), only about 1.5 billion people were here in 1900. In the next 1% of human existence however (100 years), the population increased by almost 5 billion people. Now that reminds us of the bucket question. One in seven people in the world is hungry today. But paradoxically, most hungry people live in countries where there is more than enough food. According to the UN Food and Agriculture Organisation (FAO), world production already is about one and a half times the amount of food needed to provide everyone in the world with an adequate and nutritious diet. So why is it that one in seven people is suffering from hunger? Instead of healthy, diverse food for local communities, industrial agriculture produces crops to sell on world markets, not local markets. In fact, many of these crops are not even intended for people (animal feed), or even for food (bio-fuels). World crop production has more than tripled since 1950 and that is encouraging. 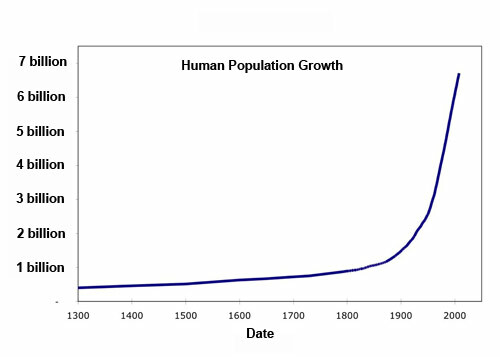 The current projection for world population growth is a simple projection based on the trends of population growth rates (a combination of birth and death rates). Although the data is not specific, I presume the census bureau also assumes that people all over the world will change their habits and vastly reduce the number of children they produce. Let’s just hope they are not assuming that the death rate will rise dramatically — the only other mechanism to keep the population growth rate low. For sure they cannot actually know the future, but this is their best estimate. Here is a projection based on work by the US Census Bureau. In 1963, the peak rate of population growth was 2.19%. By today (2012), the rate has fallen to about 1.07% (so population is still climbing but half as fast). The projection estimates that by 2050, our population will still be rising but at less than .5% per year (population still climbing but less than 1/4 as fast as in 1963). One prediction is that by 2100, the world will still be adding more people but at the hopefully low rate of 0.5% per year with a population of over 10 billion people. This means people will still be producing more babies than just the number to replace themselves (currently a TFR of 2.06). 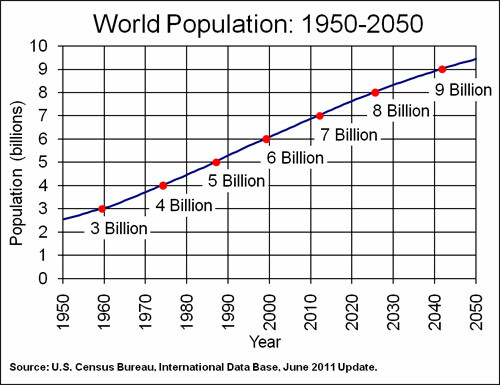 These population estimates peak out at about 11.5 billion people on the planet. To make this work, we will need to increase the agricultural production and distribution efficiency by another 2.7 times what it is today with less space to grow things, a changing climate, and increasing industrialization of agriculture. Interesting times ahead, and hard to predict what will happen. Question #1) 99 days. You have one day left to solve the problem of the escaping creature! Question #2) If you really do have to be away for 5 days and can return before the 6th day you will need to have provided a bucket that is 32 times as big as the first bucket just to contain all the creatures that might get away. If you happen to be a week late, the bucket will need to be 64 times as big. Don’t even think about being a month late, because then you would need well over two billion buckets (2,147,483,648 buckets). This entry was posted in Science by AlanEmery. Bookmark the permalink. Important question. If the current population rate of increase could somehow continue, then yes, theoretically there is no limit to the number of people we could produce. However there are some obvious limits. If there were hundreds of trillions of people, they just would not fit on the earth’s surface, there would be not enough air to breathe, and nowhere near enough food to eat and water to drink. So growth forever just is not in the cards. That means there are limits to growth. What is the limit? Is it 50 billion people? At the present time, ecologists have calculated that the probable maximum carrying capacity of the world for people is about 14 billion assuming we use every scrap of agricultural land and don’t pollute any more. People are like many animals though, there is also an optimum carrying capacity and it looks like to be comfortable on our planet, we should stay well below the 14 billion people mark. Some ecologists have suggested that with our present technology and agricultural capacity, we would be best at about 5 billion people (about 2 billion fewer than we currently have). Once again people tend to do what they want, and it looks like the target the world is headed for is about 10 billion people. This is based on the different population rates of increase in different countries and making some educated guesses about the future. At least so far, people are behaving pretty much like any other animal in an environment where there is an abundance of resources. They expand their population to the limit, then overshoot and when there is so little resource left, the animals die off back to less than the numbers that are possible for stability. If they haven’t done too much damage to the environment and no other factor intervenes, they usually come back and settle at a stable level. It looks like we (people) are still in the growth stage, and probably in the beginning stages of overshoot with premature death resulting from poor nutrition in about 1 in 8 people – or 12% of the population. When (and if) we allow death rates from poor nutrition and exposure to reach about 30-40% the entire population will likely collapse back down to about 4 million people. It will likely bounce up a bit to 6 billion then decline and stabilize around 5 billion people with some oscillations up and down in numbers. That assumes that local wars and territoriality disputes do not trigger some horrible holocaust of nuclear war. That would have unpredictable results, but none of them very nice. So let’s hope the best scenario happens in which people use their brains instead of behaving just like other animals and instead decide to allow the population to gradually decline to a nice comfortable 5 billion and at the same time develop a new culture, perhaps one similar to the gifting cultures of isolated islands whose inhabitants must depend on each other for survival. i am a student studying demography and found your article very touchy. I was wondering why the population growth trends in developing countries is very high despite several limiting factors like civil wars, famine, catastrophic events, adoption of family planning and HIV&AIDS. I thought that these factors will eventually reduce the population growth to what demographic transition theorist predicts will happen. Have a look at this chart from the CIA: https://www.cia.gov/library/publications/the-world-factbook/rankorder/2002rank.html . Instead of thinking about countries as “developed” or “developing” think about the factors that affect the growth of populations. Consider natural tendencies first. Populations rise when there is an excess of resources that are available. So rapid growth of populations occur naturally when a species is introduced into a new area where the competition is low and resources are easily available. It also happens after a natural disaster when the system breaks down and the numbers of animals are reduced suddenly (perhaps a major hurricane, a forest fire, a volcanic ash fall). So let’s look at the extremes for ourselves as people first. Syria is in the midst of a major disaster, the people are dying and running away, so they have a population that is in free-fall at -9.73%. By contrast, Lebanon has just been through a disastrous period of war for many decades, but is now in a recovery position, so there are resources available, they can import technology, and competition is at a low point. Their population is growing at a very fast rate +9.37%. Clearly neither extreme can be maintained. Also neither country was a “developing” country. Both Syria and Lebanon are very old countries that had reached high levels of cultural, technological, and economic advancement. Have a quick look at the other rapidly increasing populations. They really fall into four groups: 1) Africa where there are still huge tracts of land and massive resources (although in some cases other countries are exploiting the resources with little return to the Africans), 2) The Middle East with its newly exploitable oil resources, 3) Islands cashing in on tourism, and 4) Recent war zone recoveries (Gaza strip, Rwanda, etc.). Once the % population growth is less than 2% growth of population, the explanations are much more complicated and usually reflect (in the case of humans) increasing education or empowerment women combined with the beginnings of resource crunches. Overall, the global rate of population increase is in decline (http://www.geohive.com/earth/his_history3.aspx) from a high in the 1960’s of just over 2%, to today in 2013 with a rate of 1.14%. However all of those are exponential rates, so while the rate trend is to decline, the actual population growth is still very much positive. These estimators still see population growing into the 22nd century. If that continues, the world will be in serious trouble for resources unless an agricultural miracle occurs, global warming stops, pollution rates decline significantly, etc. It is unlikely that a world with 11 or 12 billion people would be a very nice place to live unless you happen to be one of the very few wealthy people with lots of power to defend yourself. If we take a lesson from natural populations, the “bend” in the sigmoid curve of population growth is usually the eventual stable population size. That “bend” occurred for people between the late 1980s and early 1990s, when the population was about 5 billion people. If I was asked to predict the final global population (if we survive our own internal issues), I would guess a little less than 5 billion people. When will that occur? Again if we take a lesson from nature, it is likely that the major population decline will occur a time period after the peak population about equal to the time period from the bend to the peak – in this case that will be about 150 years to the peak population and a further 150 years to the major decline. Recovery oscillations have about the same period (in this case 300 years) and the stable population depends on how severe the drop was because that determines the number of oscillations needed to stabilize. My guess is it will take at least three maybe four oscillations – about 900 to 1200 years after the fall for the human population to stabilize at around 5 billion people. The most difficult period will be between 200 to 300 years from now when I predict the major population losses will occur. Hello alan. I was wondering how about the population in the current place you are living in? Do you think it will end up increasing or decreasing? And one more question, do you think the world population will still increase even though there are some nasty viruses roaming around the planet? Hi Fish, Yes, the population in my area is definitely on the rise now and given the emphasis on economic growth as well as the continued benign living conditions, in my opinion, the population will continue to rise here for some time. The level of education means it will not be rapid, but instead a slow, steady increase. Animals and viruses (including people) have been living together for a long time. Viruses need the genetic mechanisms of animals to survive and reproduce themselves, therefore it is important from the perspective of the virus not to kill every host, but instead to develop via evolutionary pressures a balanced approach to infect but not kill the host. It may take time, but it is likely that each new virus will adapt evolutionarily long before the human hosts are severely limited in populations by the virus infections. Eventually resource pressures (food, space, energy, etc.) will force human population growth to level off or even decline. That will take many years for that to happen, and unless the shift to no growth is driven by policy, not need, it will not be a fun time.